David Wolter, Silver Connect Web Design: How Hummingbird Lowers Website Traffic – Find Out! 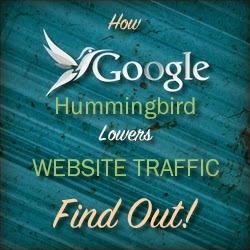 How Hummingbird Lowers Website Traffic – Find Out! The reason for this is simple: a lot of websites, in collaboration with their SEO partners, are still stuck with using the old SEO methods of simply inserting keywords and links to content and call it a day. Before Hummingbird, this was integral; but now, not so much. You could say that the reason for this is because search engines now have reconfigured its criteria in determining website rankings, but looking at the bigger picture, this update has been released due to user expectation when it comes to finding relevant and informative results. So in the past, when a search engine marketing campaign was just run by simple link building and keyword-matching, it generated frustration for searchers, since they didn’t get the information they needed most of the time. In response, Google had to change its algorithms in order to improve its methods of search processing. Lot of things you can do like focusing on website visibility, building credibility and authority among other good practices. Still, all should be centered on this idea: Google made these changes as a means of improving their role as a search engine: providing great search results to its users. In retrospect, it is not grounded around keywords and links even from its inception. So, remember this and you’ll have considerable advantage over people still stuck with doing obsolete online search engine optimization methods.